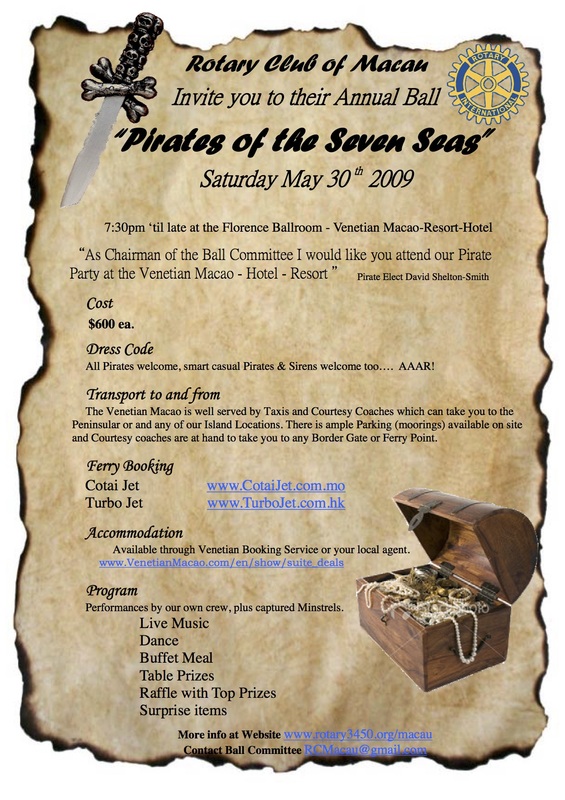 As Head Pirate of the Rotary Club of Macau please come to our Pirate Party at the Venetian~Resort~ Hotel 7pm at the Florence Suite, Aaarh! All Pirates welcome, smart casual Pirates & Sirens welcome too…. AAAR! The Venetian Macao is well served by Taxis and Courtesy Coaches which can take you to the Peninsular or and any of our Island Locations. There is ample Parking (moorings) available on site and Courtesy coaches are at hand to take you to any Border Gate or Ferry Point. Performances by our own crew, plus captured Minstrels.